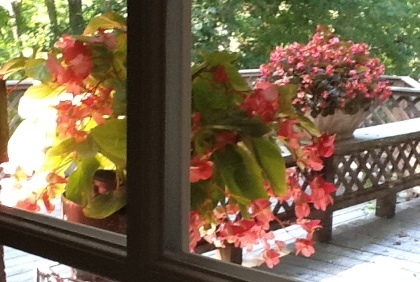 I have been totally happy with the performance of the fibrous root and dragon wing begonias this year. They just may be what works for me. What more could you ask for other than lush foliage and plenty of blooms that look good rain or shine? They did suffer an insect attack that was easily remedied with Safer spray from which they quickly recovered. A few of the brittle branches were broken by the Carolina wrens trying to get in them. It was hardly noticeable and they quickly recovered from that as well. Exposed to periods of hot burning sun as well as shade, they gracefully endured having been watered daily. I intend to use them exclusively on the deck next year. 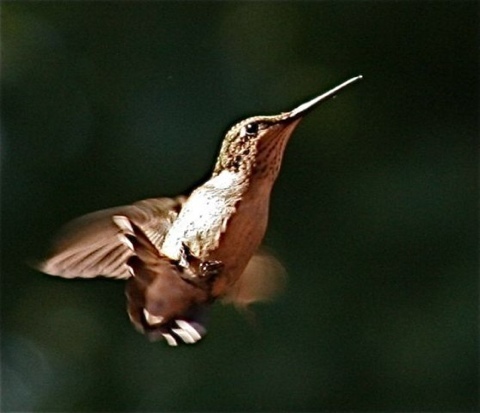 A little hummingbird was seemingly trapped on the covered deck this morning. He kept trying to escape by flying upwards continually banging his head and wings into the ceiling. I left for a time giving him a chance to perhaps regain his orientation. I returned later. Seeing him in the same situation, I offered the tip of a broom handle to him which he readily accepted. I moved him clear of the deck and he chose to rest for a minute on his perch before he took off. In the hottest part of the season after a summer shower, you may notice late season bloomers sprout. 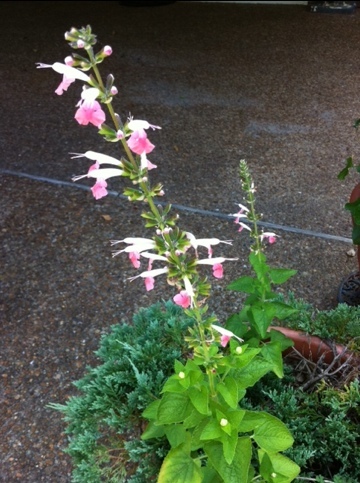 I was delighted to discover this attractive pink and white salvia/Salvia greggii ‘Coral Nymph’ had sprouted in one of my containers. I recognized the seedling because I had it planted in the same container the year before; otherwise, it may have been weeded out. There is also a red one. 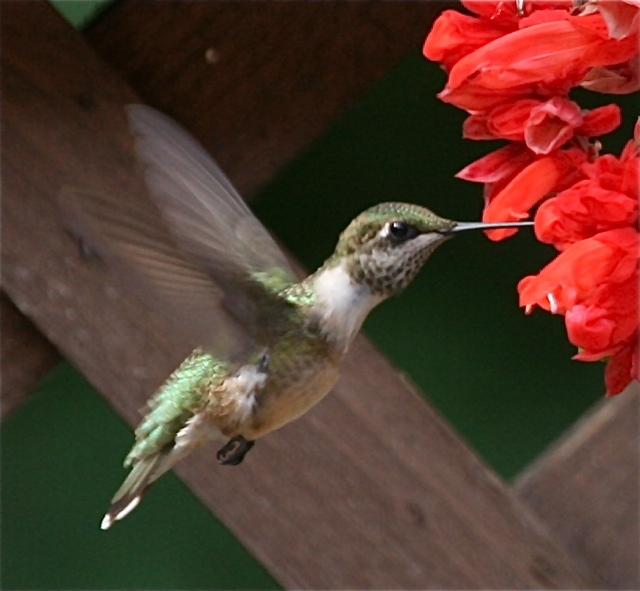 Autumn sage is attractive to hummingbirds as a new source of nectar late in the growing season. 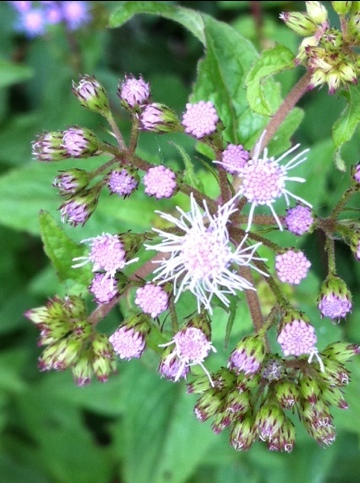 Eupatorium/mist flower is a late season perennial that adds a little blue to the garden. It is quite nice next to the rich color of rudbeckias. 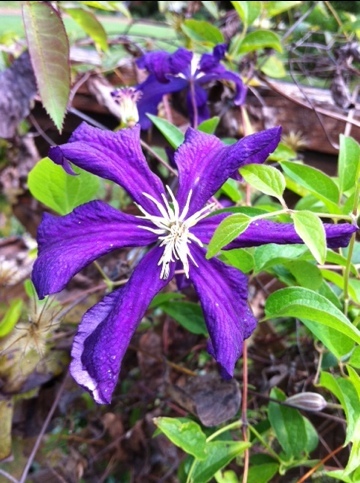 A few of the clematis that bloomed earlier this year are reblooming although sparingly. The pesky squirrels eat the water lily foliage like candy when the weather turns hot and dry. They left a bit of cover for the fishes, however. 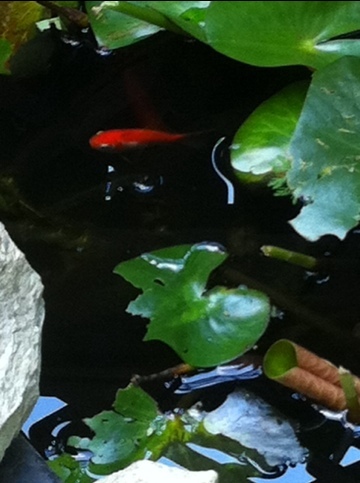 in the garden with goldfish gliding to the surface can be so relaxing. All your cares seem to slip away and you find yourself in a dreamy, creative state of mind where new ideas are born. 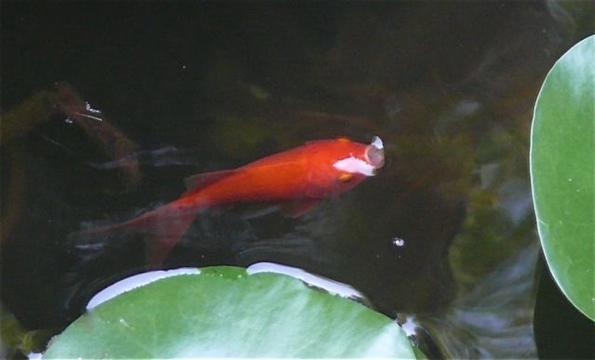 Our fish are not fed. They fend for themselves. Originally intended to control mosquito larvae, they also feed on algae and whatever other waterborne fare they can find. Oh, we do toss in various caterpillars, etc. found munching on our garden plants. Not feeding them also helps protect them from predators. They seek shelter when anything comes near. We can view them unoticed from the deck above, however. They have a valuable function in the garden. They are not pets. to Mother Nature’s Garden Evolution. Follow me. 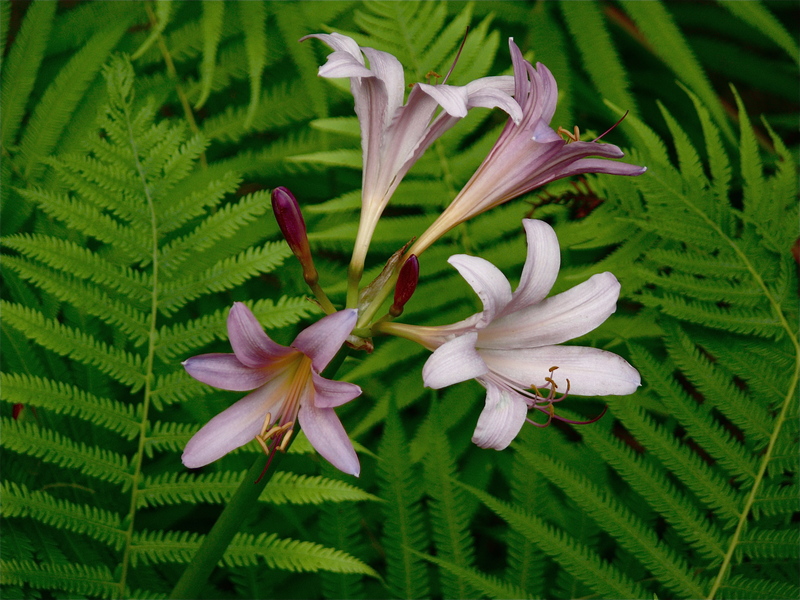 Bare stalks of Lycoris sqamigera are shooting up through the ferns with blossoms of pink with overcast blue. Foliage appears in January, dies back late spring, then blooms in the summer in my area Zone 6. There was prolific foliage this year. I hope that means greater bloom. Time will tell. 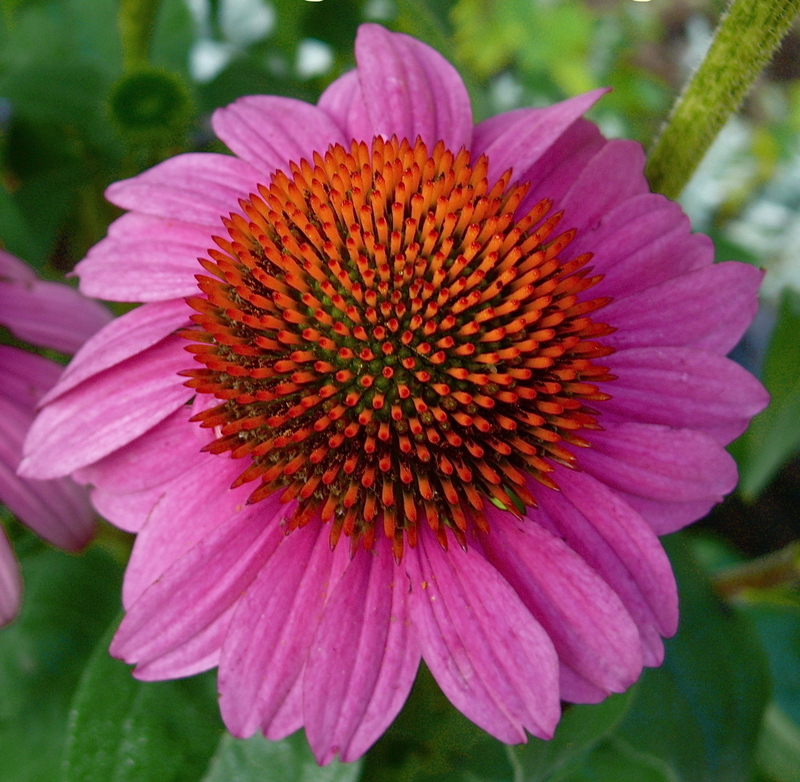 May your weeds be wildflowers.